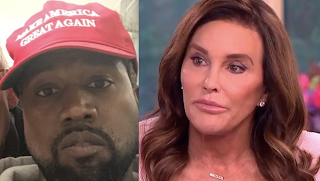 Rhymes With Snitch | Celebrity and Entertainment News | : Kanye West Bonding with Caitlyn Jenner? Kanye West Bonding with Caitlyn Jenner? Kanye is very comfortable bringing his man around Caitlyn. That MK Ultra victim/mental patient/ homeless drug addled bum that koonye is currently channeling is pure hilarity. As for the drag "qween" in kitten heels, I have no words on that next level fuckery. @1:23 - stop it Kris Jenner indeed. When are people really going to begin questioning why neither of them can keep a man? The writings on the wall. Whenever a man begins to distance himself from them, the smear campaigns begin. Watch for the patterns. Hopefully he won't end up in a dress and heels. He will. They use him to see how their makeup line looks on dark tones. Hello! He is fighting his inner woman.